Equipped with the lasted upgraded LED technology, real 3200 lumens bulb and 1280 x 800 native resolution, this projector will provide higher brightness and more vivid image to you. Bring more enjoyment from movies, sports and TV. Supports 32 - 200 inches projection size with 1.1 to 6 meters distance, with the ±15°keystone correction and 16:9 / 4:3 aspect ratio, very easy to get the most suitable and comfortable view angle, just lie on your couch to enjoy the big screen. Connect your smartphone or iPad to the projector through wireless HDMI adapter to play games on big screen, bring you more exciting and wonderful experience. Please set your laptop display setting and choose the "multiple display" as "Duplicate these displays". And please adjust laptop/PC screen display resolution to 800*600 or 1024*768 to fit the resolution of this 1080p projector. 1. This projector is designed for home cinema theater, NOT RECOMMEND for WORD, EXCEL,PPT or BUSINESS PRESENTATION. 2. The best projection distance is about 2m with projection size 80 inches. 3. Built-in 2 speakers, but for better sound performance, please connect an external speaker through HDMI or RCA L/R jack port. 4.When connect iPad / smartphone, you need a wireless HDMI adapter/MHL cable(Not Included), and make sure your smartphone has MHL function. All purchases includes 2 YEAR Warranty. If your Paick Video Projector stops working within the warranty, it will be replaced promptly.Please contact us for assistance if you have any questions. LED Projector HD 1080p Video Supported: Comes with 3200 Lumens high brightness, 50% brighter than other ordinary LED projector, 1280 x 800 Native Resolution and 3000:1 contrast ratio, ideal for home entertainment in dark environment. NOT RECOMMEND for PPT, Excel, Word, Class Presentation or any other Business Presentation. Big Screen Home Cinema Projector: Support 32 - 200 inches screen size with 1.1 - 6 meters project distance, easy to create a private home cinema, enjoy movies with your family while protect your eyes from TV, Computer, smartphone, etc. Recommend 2 meters with 80 inches screen size for better performance. Supports Front/Rear/Ceiling projection. Powerful Connection: Paick video projector supports HDMI/VGA/USB, enables to connect Amazon fire stick / Laptop/ Chromecast / DVD Player / Game Player/ TV Box through HDMI port, connect PC through VGA port, insert USB flash driver/ SD card reader through USB port, and speaker through Audio port. Adapters are required if you connect the projector to a iPad, iPhone or other tablets and smartphones. 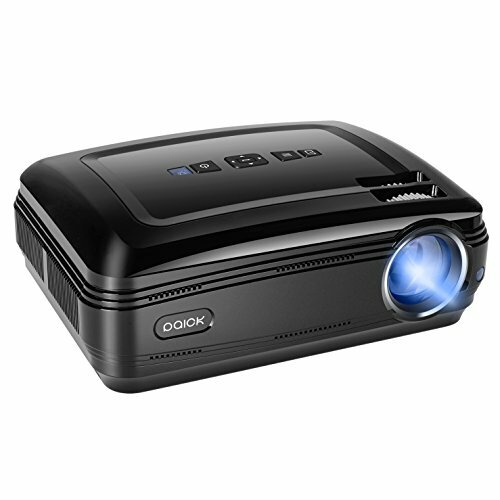 Money Back Guaranteed: We provide 2 year warranty for this LED projector. If you have any problem with the projector, like how to project it, speaker sound, keystone correction, etc. please contact us at any time, we will work hark for your 100% satisfaction.